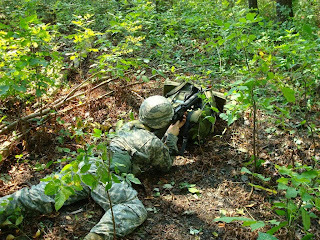 As my unit moved through the woods of northern New York state, we received new orders to scout the bank of a river for a possible crossing point. With 20 soldiers under my command, and the knowledge that there was enemy in the area, we moved forward. When we got to the identified rally point about 1/4 mile from the river, I ordered the dropping of rucks and establishment of a base of operations. With solid woodcraft knowledge, I grabbed 3 other soldiers that knew how to move quietly to round out the scouting mission to the river bank. I left a senior soldier in charge of the remaining 16 personnel, with orders to secure the rally point. If gunfire or explosions were heard, form up the platoon and move down toward the river to engage the hostiles; leave behind a 4 man team to watch the rucks when that happened. I took a small unit because as a scouting mission, stealth was the name of the game. It would be better to slip in and out unobserved rather than move en mass and get caught in a fire fight. We moved down the hillsides toward the river, taking our time moving from brush to brush, testing our footing. We didn't crawl because there was a time constraint on the mission and we weren't sure if there was enemy in the area. "CRACK!" I'm hit in the leg by a sniper who was hidden in a tree. My team immediately hits the ground and spreads out to find cover. It's a minor wound, through and through the thigh muscle. No arteries hit, definitely no nerve damage with how much it hurts! I give orders to start buddy rushes toward the sniper position, with one person laying down cover fire, while the other two move up. I also knew that 12 more of my soldiers would be coming down the hillside and support the suppression of the sniper. I hear gun fire behind us. The sniper had only fired one shot, then apparently moved behind my 4 man unit. He was heading up the hillside, probably thinking that the rally point was lightly guarded or unguarded. By moving around behind my team, he got caught with the 12 man team coming down, and was immediately engaged in a cross-fire. He surrendered, and I sent a 5 man team down to the river location while the 8 man team performed first aid on me and secured the new location. Once the 5 man team returned to the secured location, I ordered a recovery team to get our rucks and called in for a retrieval team to bring in vehicles and pick-up my patrol. Although I was shot it was a successful mission. When the supervising officer (observer) called "ENDEX" I stood up and walked to the review stage. On the ground was a "sandbox" which showed a layout of the terrain, including the hill, river, and even a road a little way back. I was instructed to provide an overview of the entire exercise, explaining how the patrol moved, why the rally point was chosen, why a smaller unit went for the reconnaissance, and what orders I left to the personnel left behind. The sniper was also at the review stage. He explained that our team was actually moving well through the woods. If it wasn't for the observer moving with us, he might have had a hard time knowing we were there. He also said he was shooting at a different person of the party. The observer designated that I was hit in order to increase the difficulty of the leadership test. After the initial shot, he thought to move back to our rally point and steal a few of our ruck-sacs, thinking that I had brought the whole patrol down with me (as previous leaders had done throughout the day). Instead he ran right into my support unit coming down to aid us. He was surprised by the tactic, and actually happy that we thought that far ahead. In the end, although I was "shot", we caught the sniper, accomplished the mission, and brought everyone out alive. The observer commented that he thought I used sound reasoning in determining to bring the smaller unit, as well as ensuring that a reserve could answer to any potential engagements that happened. He commended that I kept the 4 man team spread out and moving from cover to cover, limiting the potential for all of us to be hit in one barrage. He did offer the critique that communication guidelines between my smaller team and the reserve were limited and probably should have been further explored, but overall a good mission run. As you might have guessed, this was a training exercise, intended to evaluate leaders and teach them to think through tactical situations. 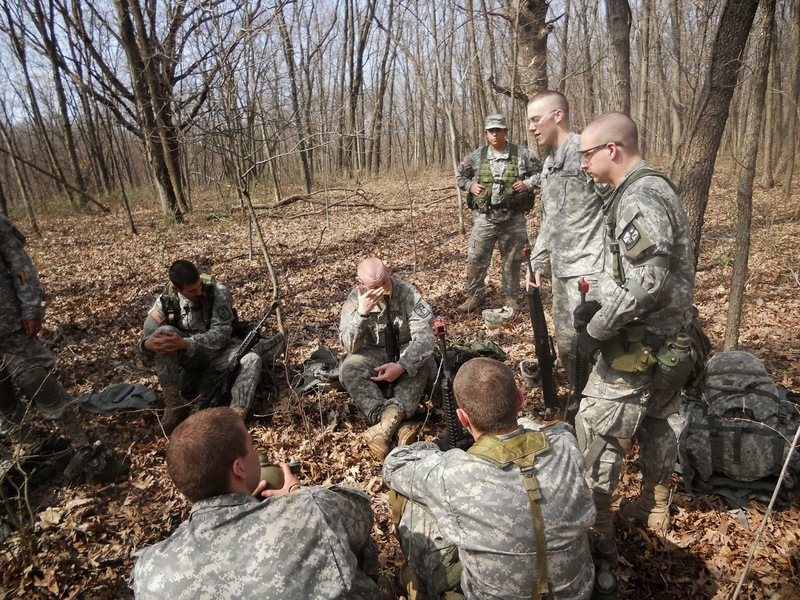 The Syracuse University Army ROTC program would once a semester move to Fort Drum in upstate New York and run it's leaders through a series of "war games" to increase their field craft, tactical awareness, and leadership skills. 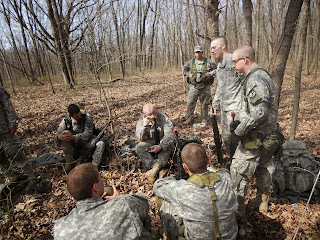 At the end of each mission an After Action Review (AAR) is held where the leaders define what happened throughout the mission and then the floor is opened to everyone present to comment and critique. It is a learning exercise, and all comments are valid. Nothing is supposed to be taken as an attack. So, what is the leadership lesson? First, I would encourage you to look at your leadership events (missions) with an eye for what is necessary to complete a job. So often we take all our resources and use them on a problem, when a better solution may be to identify the best couple of assets for the job and let them do it while the other assets are held in reserve and could be working on other things. Second, when a task is complete, do you take the time to review the task and decisions to determine what was done well, what could be improved, and what could be taught to others? Out of all the tools from my time in ROTC, the AAR is one of the strongest, and really led to the idea of COMPLETE for the fourth "C" of leadership. Without that AAR, the other people of my team may not have learned why I did the things I did, how the sniper was surprised, and that what I did was a good answer, but there was room for improvement. So much power in the AAR. Perhaps I will explore it further in another blog entry?